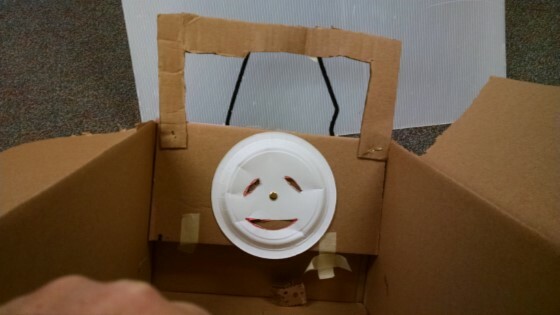 I teach a parent-child class for families with kids age 3 – 7 (preschool to early elementary) and this is one of my favorite projects for getting parents and children working together on a fun imagination challenge. Each family is asked to bring in a large box – something big enough for their child to sit down in. Some brought file boxes, some apple boxes, some shipping boxes or boxes from small appliances. 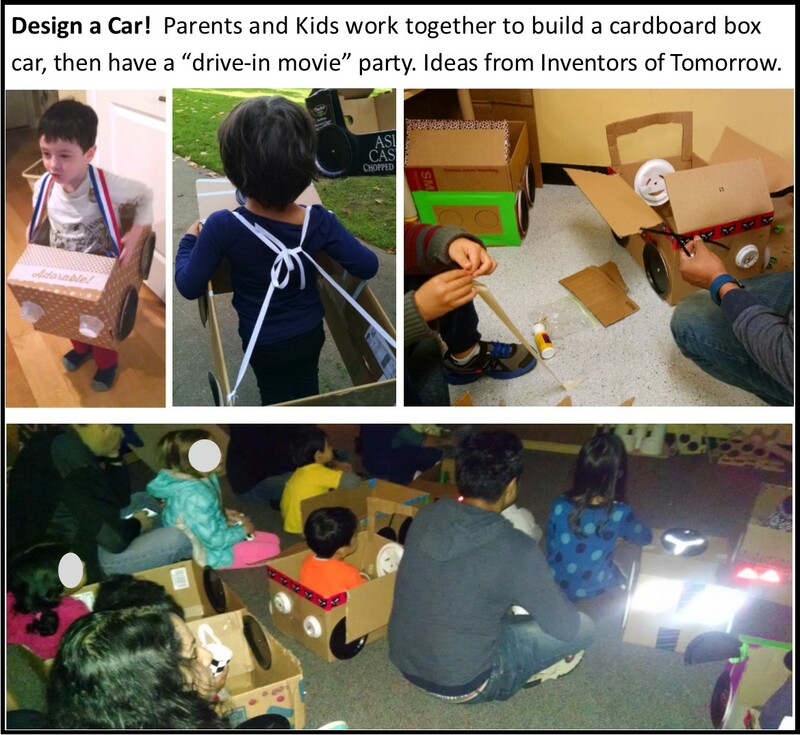 I put posters up on the walls with some ideas to get them started (here’s a set of posters you could use for inspiration) but then encouraged them to be creative, use their imagination, and build the car any way that they want to. All the ideas below are suggestions, not required steps! It’s all about how the child wants their car to look!! If the child gets bored after they put two wheels on, you may let the parent know it’s OK to choose to move on. 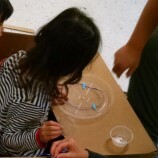 But some kid-parent teams really stick with this projects and get really creative. The first thing to decide on: does the child want to just sit in their box car? If so, skip this step and move to the next. Or would they like to be able to wear it like a costume and walk around in it? Cut off the bottom of the box. Poke holes and tie on strings… one on the left side, one on the right side. 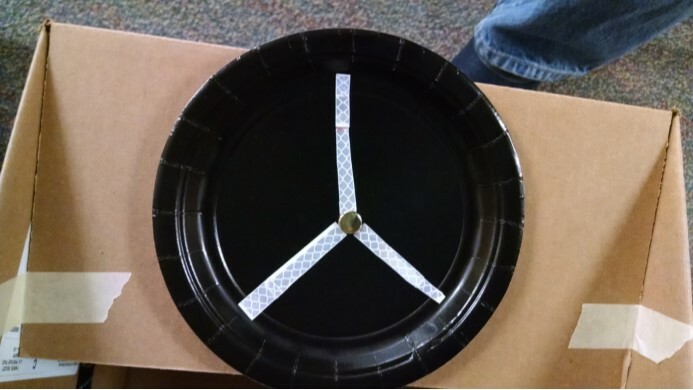 You can cut out big circles of paper for wheels or use regular paper plates. I like using black dessert-sized paper plates. You can just tape these on, but it’s more fun if they turn. To do this, place one plate where you want it to be on the box. Then have a grown-up use a tool like an ice pick to punch a hole through the center of the plate and through the wall of the box. Push an extra long brad / Paper Fastener through the hole, and fold its wings open. Almost anything circular works! I’ve had kids tape on plastic lids, plastic snak-pak containers, cupcake wrappers, and more. Round stickers could also work. 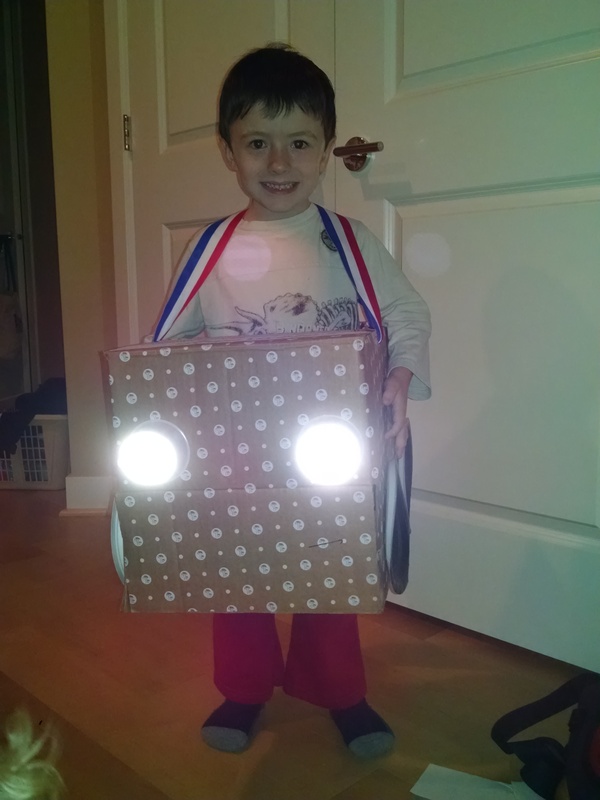 My favorite is reflective tape circles… look what happens when you take a picture with a flash! Note: the reflective tape I found in the past was VERY expensive, and tricky to peel the backing off of. I’ve found a new brand of reflective tape that’s much cheaper that I plan to try next time. 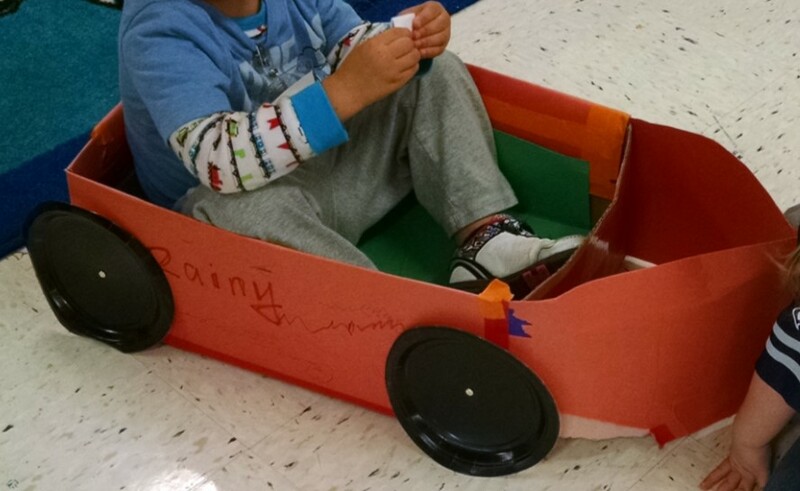 If you have time and can handle the mess, you could paint the cars. It’s not something we can do in the context of my two hour class, but it can lead to some great results. (Just search Pinterest for inspiration!) We just decorate with markers, dot paints, stickers, and colorful tape. At the end of class, instead of our usual closing circle, we gathered everyone for a “drive-in movie”. 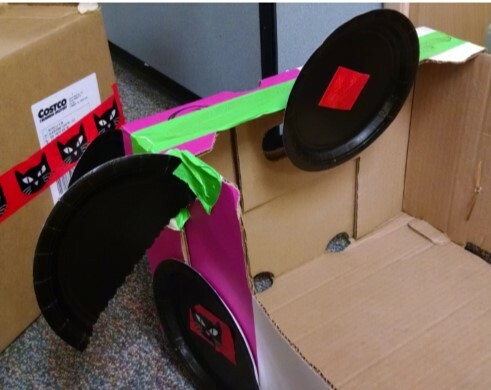 The kids brought in their cars and sat in them and ate popcorn while we watched a Sid the Science Kid episode called Climb, Ignatz, Climb which is the final wrap-up episode of their simple machines unit.